After 3 years without leaving the Chesapeake, Merlin and her crew are planning on a summer trip to Maine! We hope to get underway in June with Tina’s brother on board as well. We are busy getting Merlin ready for the trip with new sails, new 750AH battery bank and new enclosure. Those upgrades are almost complete and water is turned on at our dock in the next 2 weeks. Then we can really start cleaning and loading provisions and things back on board. Hopefully we will do a better job keeping up with our blog! Well I’ve been really bad about keeping this up to date, but here’s a summary that hopefully I can flesh out later. 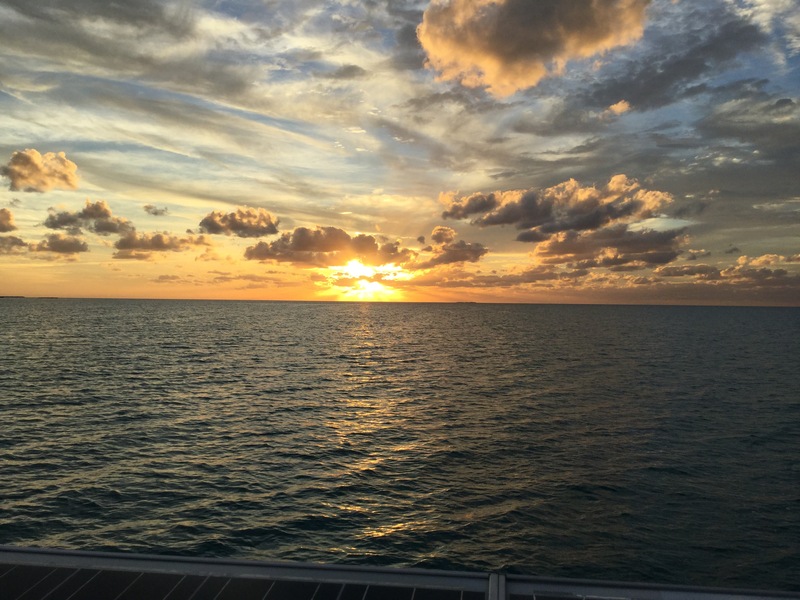 Mar 22 – depart Green Turtle for U. S.
We decided that it’s time to start heading home, as did Heeling Time, so we left Emerald Bay headed for White Bay. 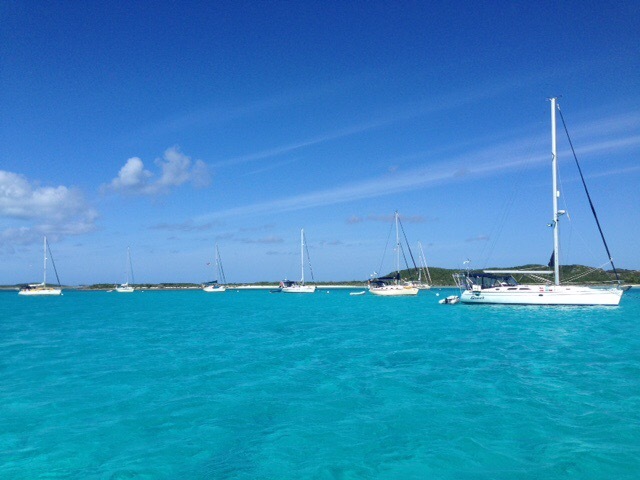 30 miles in Exuma Sound and then up the bank. We used Cave Cut and came in against 4 knots of current. A little standing wave, but no rage or anything. We anchored off the beach for the night and relaxed. After Musha Cay we headed out Rudder Cut and headed into about 14 knots of wind on a very close reach so we motor sailed. We had a bit of excitement when the oil pressure dropped to zero. After about 15 minutes of troubleshooting we determined that the wire to the sensor broke, so we just ignored the gage. We arrived at Enmerald Bay after about 6 hours and entered the narrow channel behind the breakwater. There was just enough swell to make it interesting. Onward and Merlin joined Heeling Time on D Dock, which is the $1 a foot dock since there is no electricity available. 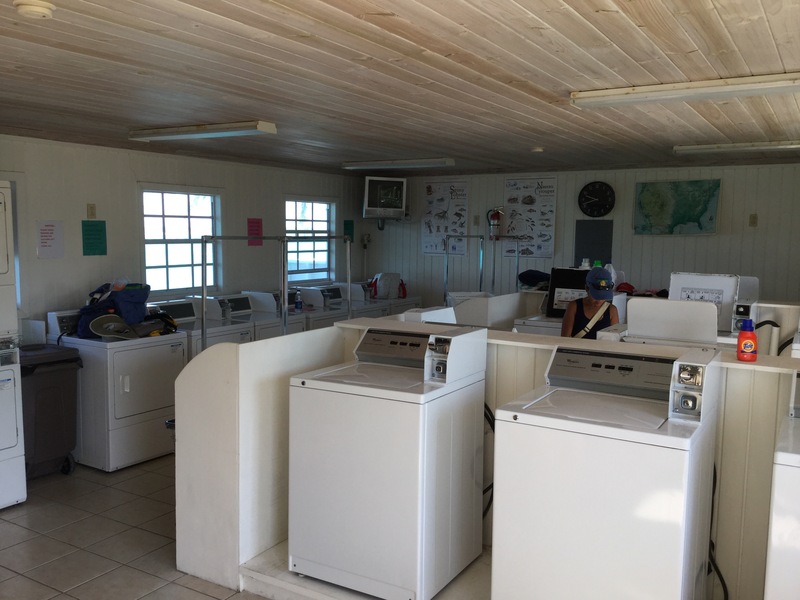 But the marina has free laundry so that was done pretty quickly. We rented a 6 passenger car with the other boats and explored the Island driving down south of the Tropic of Cancer for lunch and exploring ruins. We also drove into town for a grocery run at Exuma Market. Tina and I explored Sandals’ beach and walked out to see the breakwater from the dirt side. We stayed 3 nights. The wind has finally dropped to 15 after what seems like a week at 20+. Musha Cay is owned by David Copperfield and is a beautiful spot. The horizon for more than 180 degrees looks like this. I am woefully behind in our posts, but we’ve been busy! Our friends Peter and Shelagh visited from London last week. 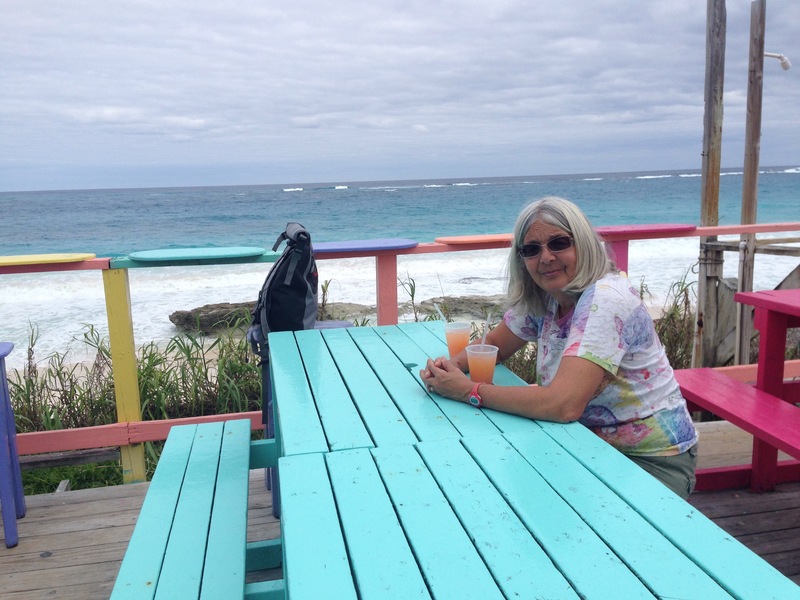 It’s not always easy to get to an airport at the right time and place when the weather is as bad as its been this year, but the weather cooperated and we made it to Staniel Cay for both flights without issue. We had some good days while they were here first heading up to Warderick Wells on the banks where we were able to get a mooring ball in the North Field. There was a cruisers meet and greet on the beach that night which is always fun. Peter and Shelagh fit right in with the group. We decided to spend two nights there so we had a chance to hike up to Boo Boo hill and leave our boat board and also do a bit of snorkeling. The reef was in good shape and there were lots of fish. Tina and Peter hit the jackpot seeing two large Eagle Rays up close. After that we headed south to Cambridge Cay down the sound so we had a nice trip in deep water. While at Cambridge a 50ft Beneteau sailboat got stuck on the rocks in the inlet, so all the dingys in the mooring field headed out to help. About an hour later they were free. Then we headed to Blackpoint on what started out to be a nice brisk sail in 20 knots. 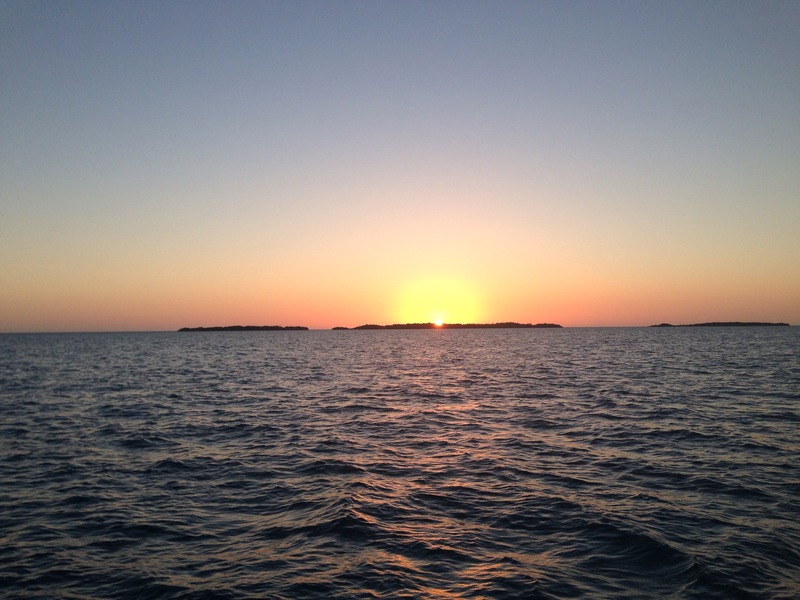 The winds built to 25-30 on the nose and seas built to maybe a short 4-5 ft chop, so we cut the trip short and anchored by Sampson Cay and spent a nice quiet evening. Then on to Blackpoint the next day for a Bahamian Settlement visit. 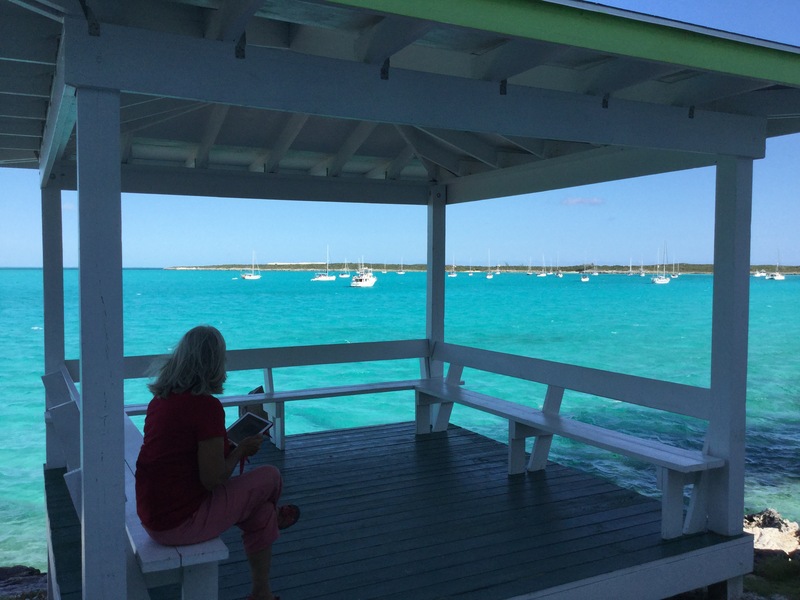 Yesterday we headed back to Staniel Cay for a nice lunch at the Yacht Club and walked to the airport to bid adieu to Peter and Shelagh. We had a great time with them. Then back to Blackpoint before sunset. Now we are sitting in the laundromat washing clothes for the first time in weeks. The winds will be over 20 for the best part of the next week, so we may be here a while….we’ll see. The laundromat here is great and well known. They even sell T-Shirts. We have made good progress since Current Cut in mostly good weather. 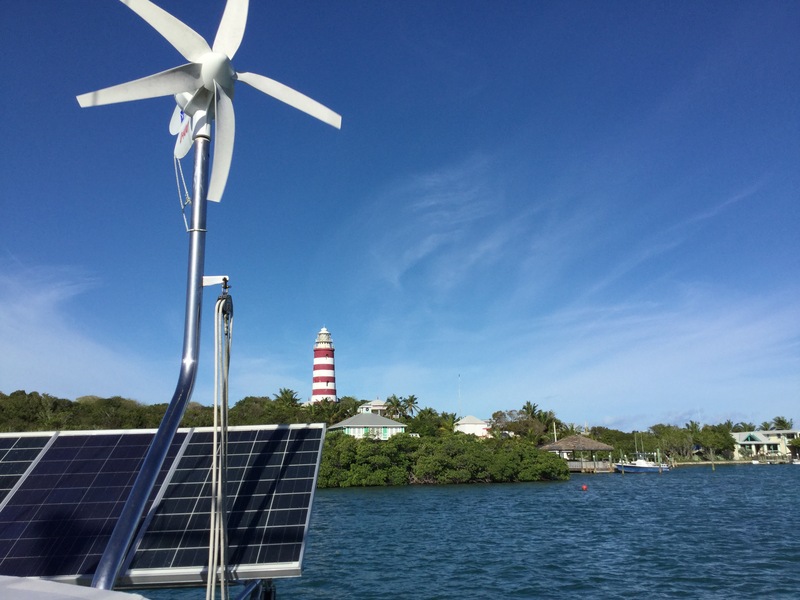 We motor sailed the 60nm to Cape Eleuthera where we spent the night at the Marina. It was a chance to top up the fuel, wash clothes, and have one last night out at a restaurant before we go a little more remote. The next morning we got the weather forecast from Chris Parker which said a chance of 30knot squalls, but no lightning. The gradient forecast called for light winds so we decided to take our chances with the squalls and left by 8am. The winds were ok, so we motor sailed tha 30 miles to Warderick Wells and checked to see if we got assigned a mooring in the North Field. All three of us got moorings, after digning up for the wait list the day before. 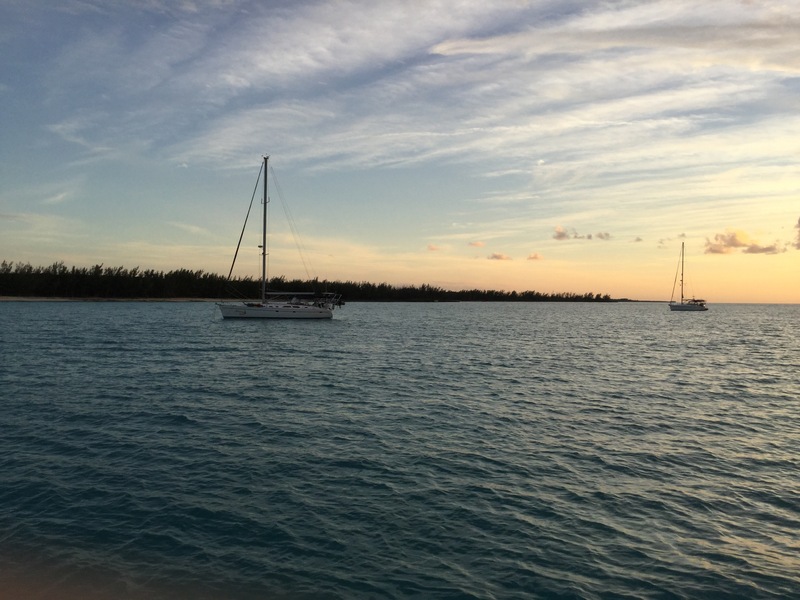 Ed fished all the way to Eleuthera from Abaco (60nm) and from Cape Eleuthera to Warderick Wells (30nm) with no luck. We were hoping for some Mahi. A couple of hours after we got settled at Warderick we were hit with a pretty good squall, so the boat got a good rinse. After 3 days of partying on the beach, snorkeling and hiking the hills we left for Cambridge Cay. We took the short route out in the sound rather than the protected waters on the banks. Winds were on the nose at 10-20k and the seas were sloppy and the boat is now caked with salt, but the cuts were easy and we are sitting on nice moorings here. Last night there was a meet and greet cocktail party on the beach. Today it’s hot and still which meant great snorkeling at the cut and in a cave. Then we went over to an area called Rachel’s Bubblebath where waves from the sound hit the rocks and surge over the top filling the little pond are with foam and spray. Great fun. There is a storm coming Sunday and then west winds so we will sit here another few days. This is a very narrow cut between Exuma Sound and the Atlantic Ocean. The Atlantic Ocean side is protected by many reefs so waves are not an issue, but max currents of up to 10 knots can be. Needless to say a little care is best. We are luckily at a time where high and low tides are not extreme which makes the current less extreme too. Slack water in the cut is predicted to be 2-2 1/2 hours after high or low tide at Nassau. Low tide this morning at Nassau was 0644 making slack water at 8:45 to 9:15. We ended up going thru at 7:30, about 1 – 1 1/2 hours before slack. So we ended up going against just 1 1/2 knots of current. An easy passage, just the way we like them.